Organic vegetable farmers rely heavily on intensive soil tillage to control weeds, incorporate amendments and cover crop residue, and prepare clean seedbeds. Intensive tillage, however, can decrease long-term soil health by causing compaction and loss of soil structure, organic matter, and moisture. Tillage can also be costly to farmers by consuming time, fuel, and labor. Reduced tillage is particularly difficult to incorporate into organic systems because farmers cannot use herbicides to control weeds. 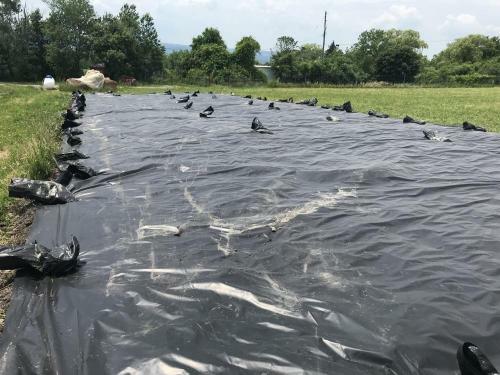 The use of black, impermeable, plastic tarps placed on the soil surface prior to planting could reduce weed pressure, decompose crop residue, and preserve prepared soil for several weeks. This article assesses the potential uses of tarps in organic vegetable systems to reduce or even replace tillage by controlling weeds and decomposing crop residue. Figure 1. A black plastic tarp laid over full-length crop beds. Photo credit: Haley Rylander. The use of synthetic soil covers, including plastic, is already a common, long-studied practice in both organic and conventional production. Transparent plastic sheets are widely used in times of bright sunlight as temporary soil covers for solarizing soils—a physical method that raises surface temperature to extremes that kill weeds and pests (Abu-Gharbieh et al., 1988; Link, 1994). Soil solarization, however, needs extreme heat in order to be effective at weed suppression, thus limiting this approach as a viable option in the Northeastern United States. Black plastic mulch and landscape fabric are also well-known synthetic covers for suppressing weeds, conserving soil moisture, raising soil temperatures, and increasing crop productivity (Kasirajan and Ngouajio, 2012). Unlike mulches and landscape fabrics, tarps do not remain in place for planting, but are used for short periods throughout the seasons between plantings. Similar to mulches, plastic tarps impact the temperature, moisture, and nutrient profile of the soil as well as weeds and residue. Why not simply use landscape fabric for pre-planting tarping? Landscape fabric may provide some of the same benefits as thicker, impermeable tarps, but it does not create the same soil environment nor does it affect weeds in the same way. Weeds can root down into landscape fabric if seeds land on its surface, and some weeds can even break through the fabric from underneath. Landscape fabric also allows water and airflow to the soil surface, enabling leaching and taking longer to kill weeds that have already emerged. One of the most common questions we receive from farmers is “what exactly is a tarp?” A tarp in this context is a large, moveable sheet of thick black plastic that is impermeable to water. It can be rolled or folded and stored when not in use, and lasts many years if handled with care. Tarps can be cut to any size, but are typically around 100 ft long and wide enough to cover one or multiple beds in a field (from 10–30 ft) (Fig. 1). Available labor should be considered when choosing a tarp size, as very large tarps can weigh up to 50—75 lbs and may be difficult to maneuver with just one or two people. On the whole, however, tarps do not require a significant number of people to lay on the soil or store, do not take long to apply, and are relatively cheap ($100 for a 100 x 24 ft tarp). Choosing days with minimal wind is helpful when laying tarps. Tarps are secured with heavy objects such as sandbags or stones placed around the edges. There is no need to form a seal on the edges. Tarps can be applied to fully-prepared soil (lightly tilled, amendments added, residue incorporated, etc. ), or laid directly over a mowed cover crop or weeds, and can be left in place for any length of time, though most beneficial effects need at least three weeks. Unlike tillage, tarp application is not dependent on weather or soil conditions. Using tarps conserves fuel use, labor hours, and soil compaction from heavy machinery. Soil is left undisturbed and is able to conserve moisture, organic matter, and structure. Leaching and waterlogging from rain and snowmelt are also prevented. 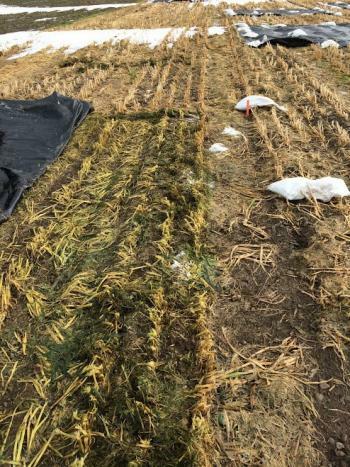 We have spoken with farmers and conducted experimental trials to assess the effects of tarps left on the soil for different lengths of time (from three weeks to overwinter) and in combination with no-till, shallow-till (1 in), and rototill (4 in) treatments after tarp removal. Figure 2. An overwinter tarp pulled up in early spring shows no residue decomposition—some of the residue is still green. Photo credit: Haley Rylander. It should be noted that tarps are not meant as a replacement for cover crops, as they do not add nutrients or organic matter to the soil. Many growers already using tarps have reported that cover crop residue completely decomposes when left underneath tarps for several weeks. We did not observe this in our trials. In fact, crop residue seemed to be almost preserved under our overwinter tarps (Fig. 2). This may be due to decreased surface temperatures throughout the winter. Many farmers who report residue decomposition also irrigate, add organic amendments, and/or finely chop or incorporate residue into the soil just before laying tarps, whereas our experiments left crop residue exactly as it was on the soil surface. It is likely that using water and amendments and incorporating crop residue prior to tarping increases soil microbial activity under the tarp, causing a more rapid decomposition of residue. Figure 3. Four plots with different tarp treatments right after tarp removal in late spring. Clockwise: Tarp applied 3 weeks prior to planting, 24 weeks prior to planting (overwinter), no tarp applied, and 6 weeks prior to planting. Photo credit: Haley Rylander. Arguably the most important benefit of tarps is suppressing weeds prior to planting a crop. No weeds can germinate and survive underneath an opaque tarp, and any emerged weeds prior to tarp application are killed within three weeks due to light suppression. In our trials, there were no weeds present in tarped plots at the time of removal (Fig. 3), and 10 days after planting there was an average of 96% less weed biomass in tarped plots than untarped weedy control plots. By the time of harvest in our experiment, there was no significant difference in weed biomass between tarp treatments. The same experiment in Monmouth, Maine and Riverhead, New York did show significantly lower weed biomass in tarped plots at the end of the season. Season-long weed suppression by tarps is still unclear, and may depend upon individual weed communities. It is clear, however, that tarping gives a beneficial head start to crop seeds or transplants. Regardless of weed biomass, beet yield did increase with tarp use. Average beet yield in our early planting was 43-82% higher with use of tarps in shallow-till plots, and 7-26% higher with use of tarps in rototill plots. There was no marketable yield without tarps in shallow-till plots of our late planting, but with tarps, yield was comparable to that of rototill plots. Average yield in rototill plots was 59-98% higher with use of tarps in the late planting. These increases, despite comparable weed biomass across treatments, may be due to the early-season head start with decreased weed competition, or increased nitrogen concentrations in tarped plots. A common question from farmers is whether tarps create a stale seedbed in which weed seeds are stimulated to germinate and then killed. It is clear that some weed seeds are in fact germinating underneath tarps because we have found small, stunted weed seedlings on the soil surface after tarp removal (Fig. 4). It is possible that increased temperatures and preserved moisture under tarps stimulates seed germination. However, the extent of this effect is not known. Tarps are often applied in early or late spring when the soil has not warmed and weed seeds have not begun to germinate. Tarps applied later in season, especially after light soil disturbance or watering, could potentially be used as a stale seedbed method. We did not experiment with this, but we did lay our 3-week late-planting tarp over already emerged weeds, and no living weeds were present at the time of tarp removal. In our research trials, there was never a significant difference between tarp durations when it came to weed suppression or crop yield increase. From this, it can be assumed that laying a tarp just three weeks prior to planting should be enough to see the desired effects of weed suppression. 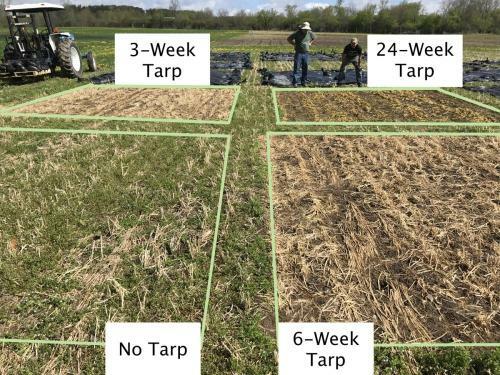 We also found that using tarps for three or more weeks greatly reduced the difference in weed biomass and crop yield between shallow-tilled and rototilled plots. Using tarps, in other words, made shallow-tilling at 1 inch about as effective as rototilling at 4 inches, whereas non-tarped plots often had significantly fewer weeds and higher yield in rototilled plots than shallow-tilled plots. Figure 4: Stunted weed seedlings on the soil surface under tarps. All seedlings were dead after a few hours of exposure. Photo credit: Haley Rylander. Water can flow under the edges of tarps to an extent, but rain infiltration and pooling or waterlogging by rain and snowmelt is prevented. Tarps hold soil moisture relatively constant throughout their duration. These effects may differ with sandier soil types, but in the gravelly loam of our experiment, soil moisture under tarps was retained throughout the season. Water will flow off of tarps, however, and where it flows should be considered. If possible, water should be directed towards perennial alleyways. Soil temperature does not rise to extremely high temperatures under tarps, such as with soil solarization, but temperatures do rise a few degrees. This could potentially stimulate fatal weed seed germination and increase soil microbial activity. Plant-available nitrogen (NO3 and NH4) in the soil is extremely important to crop growth. With no amendments added, soil nitrate (ppm) increased significantly with tarp duration. Plots in Freeville, NY with a tarp duration of three weeks had an average of four times more nitrate than plots with no tarp, and an average of five times and nine times more nitrate with a duration of six weeks and ten weeks respectively (Fig. 5). Ammonium was not significantly affected, but nitrate is the primary form of nitrogen used by plants. There are many possible explanations for this increase in nitrate. First, tarps prevent leaching. Nitrate is very soluble in water and leaches easily from the soil if not taken up by plants. Second, tarps prevent waterlogging of soil. Anaerobic environments can promote denitrification, in which soil microorganisms take oxygen from nitrate and convert it back to gaseous N2. Third, even slightly increased soil temperature may be enough to promote microbial activity and mineralization/nitrification (conversion of atmospheric and organic nitrogen into a plant available form). 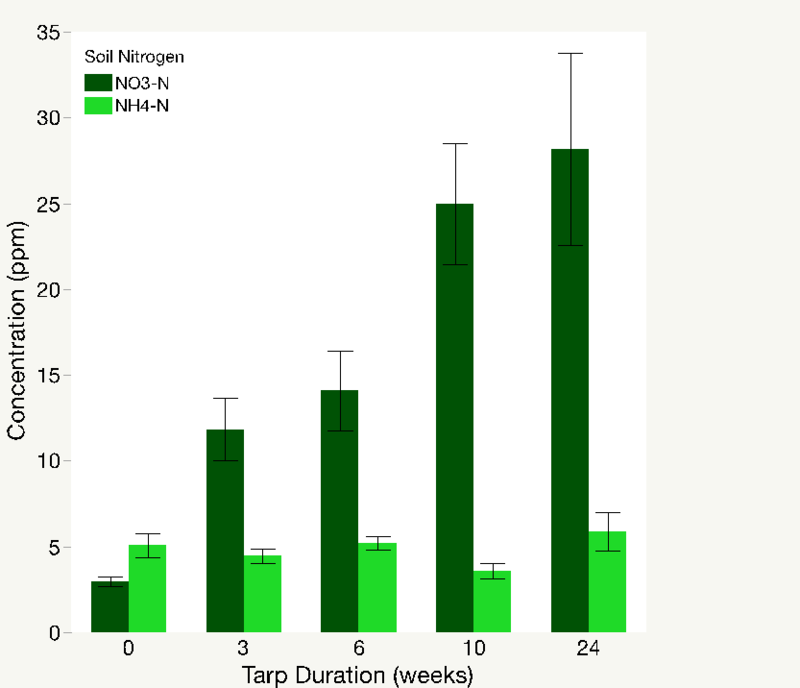 Figure 5: Concentration (ppm) of average soil nitrate (NO3) and ammonium (NH4) at the time of tarp removal in plots with tarp durations of 0-24 weeks prior to crop planting. Data taken in Freeville, NY. There is still a lot to learn about using tarps in farming systems. For example, we do not know how tarps may affect worms, microorganisms, fungi, or soilborne diseases. Does preparing the seedbed before tarp application provide more benefits than preparing it after tarp removal? Despite these unknowns, there are clear benefits to incorporating tarps into organic vegetable systems. Hopefully, further farmer experience and research can unlock the potential of this innovative tool. Abu-Gharbieh, W. I., H. Saleh, and H. Abu-Blan. 1988. Use of black plastic for soil solarization and post-plant mulching [Online]. Plant Protection Department, Faculty of Agriculture, University of Jordan, Amman, Jordan. Available at: www.fao.org/docrep/t0455e/T0455E0j.htm (verified 22 Aug 2018). Kasirajan, S., and M. Ngouajio. 2012. Polyethylene and biodegradable mulches for agricultural applications: A review. Agronomy for Sustainable Development 32:501–529. Available online at: http://dx.doi.org/10.1007/s13593-011-0068-3 (verified 22 Aug 2018). Linke, K. H. 1994. Effects of soil solarization on arable weeds under Mediterranean conditions: Control, lack of response or stimulation. Crop Protection 13:115–120. Available online at: https://doi.org/10.1016/0261-2194(94)90161-9 (verified 22 Aug 2018).